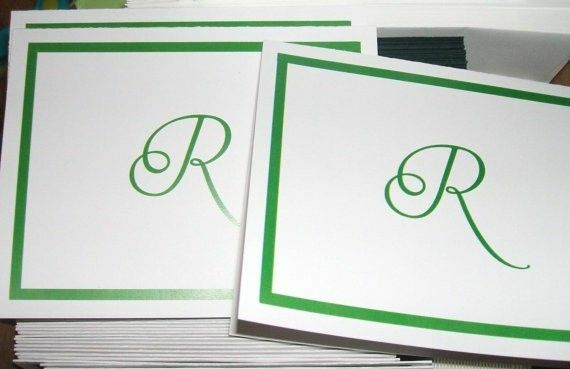 This listing is for 50 custom designed monogrammed Thank you cards. These are perfect for after the wedding, or after your bridal shower or other event. Makes a great personalized gift as well. Personalized monogrammed Thank you cards are customized completely to your special day, your color palette, we can match the font you have used on other paper products for a cohesive feel even on the last item your guests will see from your big day. Cards shown are with a colored border, this can be removed, and another design can be created, we can even coordinate with your invitations, if that is what you would like. These notecards are blank on the inside so can be used for other things besides thank you cards, if that is what you would like, also if you prefer we can add the word Thank You to the front instead of just the monogram, whatever you would like. Notecards are 4.25 x 5.5 folded size can be horizontal or vertical in orientation and will be customized to fit your style, and colors. Pictures are just an example of one style- any color or style available. This listing is for a set of 50 Thank you cards, if you need more or less please convo me for prices and a reserved listing. After purchase I will convo you to get details of your wedding, colors, theme, with in 24 hours I will provide a digital proof. Upon final approval of digital proof cards will be shipped with in 2 weeks. If you need a rush order please convo me first so I can arrange for that type of order. There is a rush order charge of 10.00. Cards can be done with a photo of the happy couple on the front, or pictures of a special place you have visited, it is all up to you, the bride and groom. Photo style cards are a bit more expensive so please email me first for details but we can do anything you would like.